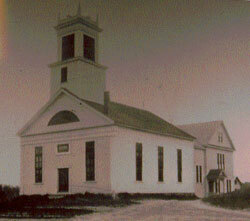 The First Baptist Church of Hudson was organized May 1, 1805 as “The Church of Christ in Nottingham West”. The organization meeting was held at the home of Deacon Thomas Senter on what is now the Old Derry Road. Deacon Senter’s home was in that part of Nottingham West which was within the town of Londonderry. A group of 65 people petitioned to be “set off” from the Baptist Church in Londonderry in order to form a “distinct” church. The reason was one of convenience of travel as the homes of these persons were scattered and somewhat distant from the Londonderry church. 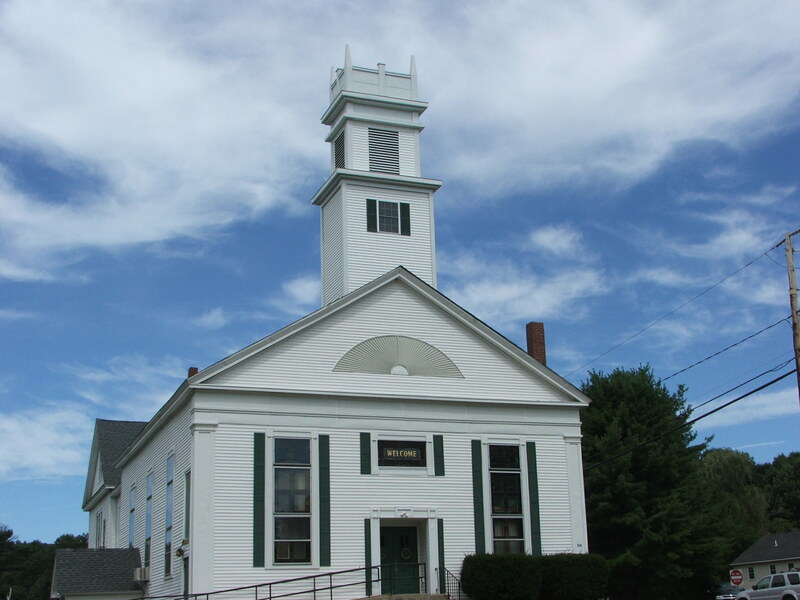 At first meetings were held in the North Meeting House which was owned by the Presbyterians and located a few roads east of the present church near the location of Wattannick Grange Hall. In the winter many meetings were held in homes as the building had no stove, no chimney, and no heat! Foot stoves were used in the sleighs while traveling to meetings and then carried into the meeting house. In 1811 the Baptist Society was organized and the North Meeting House was purchased from the Presbyterians. 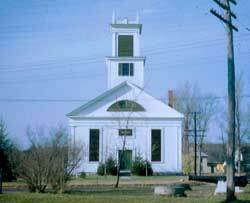 Interest in having a more convenient house of worship began about 1839. 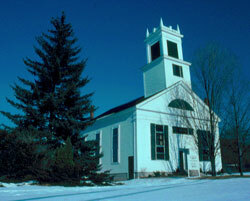 The North Meeting House had no bell or belfry, was unpainted, and had no heat. Two lengthy services of almost two hours each were held each Sunday. As the Baptist membership grew, it became more necessary to build a church. Reuben Greeley deeded a lot from his property to the Baptist Society. There was an existing building on this lot; it was moved easterly on Windham Road and became part of the Dr. H.O. Smith house. The moving bill was $40.60. The sanctuary of the present building was then erected in 1841 and dedicated in 1842. 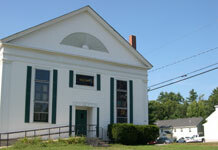 The North Meeting House was then deeded to the town. 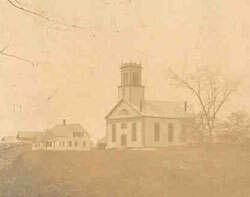 The New meeting house, on the corner of Windham Road and Greeley Street consisted of the sanctuary and a two stage steeple. The top of this steeple was a large cupola with spires representing Matthew, Mark, Luke and John. In 1847 the present bell was purchased by public subscription and placed in the cupola. The first organ was given to the church in 1850 by Dr. David O. Smith. This was replaced by Dr. Smith in 1888 with the present Woodbury and Harris Tracker Organ. This fine musical instrument was given in honor of his daughter, Martha, who was an accomplished organist and pianist. The original cost of this organ was $1,820! Alterations were made to the sanctuary at that time. These included an alcove to house the new organ, a set of pulpit furniture, and colored glass windows. In 1897 the exterior of the building as we know it today was completed when the 2 story vestry was added to the rear of the church. This was a gift from the Smith and Haselton families. Additional space was added in 1968 when “Project Excavation” placed a new foundation under the sanctuary, making an additional room for the Church School, meetings, and for a new larger kitchen and dining room. This area was named Memorial Hall as many gifts helped to finance and complete the project. Many changes and improvements have been made to the interior of our church building. The sanctuary was once lighted by kerosene lamps and heated by wood stoves. An electric chandelier was once in the center of the sanctuary ceiling. At first the sanctuary had the single exit door at the rear of the church. When the vestry was added in 1897, the front exit leading to the vestry and Memorial Hall was added. Many spiritual events have marked the history of our church. Perhaps the most significant in recent years have occurred as the result a decision made in 1986 to share our facilities with New Fellowship Baptist Church under the leadership of Rev. Bertha Perkins. A strong relationship between the two congregations and their pastors was established and this bond continues to this day. In early 2000 our church started a project to remove and replace the steeple on it’s 159 year old building. The decision to replace the steeple was made after much thought, and many attempts to tighten up, repair, and secure the old structure. The condition of the structure had deteriorated badly over the years. Work has completed to replace the steeple with a structure which duplicates the original style. In 2014 our church begins a new chapter in our history, with a new pastor. It seems only fitting, at this time, to re-publish an article (written many years ago) on the Diversity of Pastors at First Baptist Hudson. Click here to read more.